Scholars contend that Paleoamericans migrated into North America 47,000 to 14,000 years ago, and from there dispersed throughout the Americas. The ancient land bridge, known as Beringia is believed to have existed until about 12,000 years ago, and after it was flooded, Paleoamericans were separated from the rest of the world. That is until Christopher Columbus explored America in 1492 and Europeans colonized it thereafter. North American Indians lived sustainably for at least 12,000 years and developed a sophisticated, albeit technologically primitive, culture. Eastern North America has been colonized for about 400 years, and The West, merely 200 years, and yet, the health of land, water, the air, many critters and ecosystem is already under threat. The land that Native Americans sustained for over 12,000 years is being destroyed by Western Civilization in a matter of few centuries. And Hydraulic Fracturing is the most recent cycle of that insanity. In just the last 12 or so months, there has been 9 major oil spills. 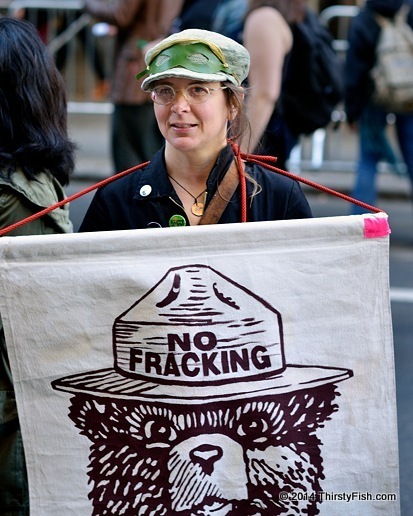 But fracking is way more dangerous than traditional means of fossil-fuel extraction. How can injecting a mixture of water, sand, and cancer causing chemicals underground at high pressure to fracture rock in order to extract oil or gas be considered safe? Where do all those nasty elements and chemicals go? Ground and drinking water contamination? As if the impending disaster from Climate Change was not fatal enough, the oil industry is rushing in to exploit fracking and tar sands. It's insanity on steroids! It doesn't look like there is a political solution to this insanity. Politicians have long been bought and paid for by large corporations and the oil industry. Without shame, they are even capitalizing on the Russian energy threat in Ukraine and in Europe for further deregulation of the oil industry. Senator McCain recently suggested that we "permit and enhance the exportation of U.S. oil and natural gas ... in order to decrease Europe's reliance on Russian supplies of energy". I'm not sure that this insanity is going to stop until we destroy ourselves and the ecosystem - until collapse.